This is one of my all-time favorite recipes. It’s a great dessert AND a great breakfast 🙂 The best part? 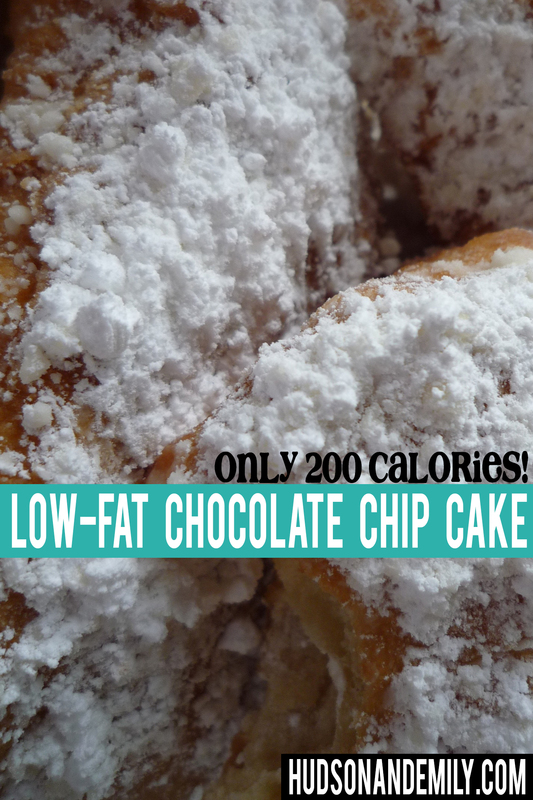 It’s less than 200 calories per serving! 2. Take butter out of fridge to soften. 3. In large mixing bowl, stir together flour, sugar, brown sugar, baking powder, and baking soda. 5. Add mashed bananas, yogurt, butter, and vanilla to mixture. 6. Beat until combined, then beat one minute more on medium speed. 7. Add eggs and beat one minute more. 9. Grease 9×13 pan and pour batter inside. 10. Bake 30-35 minutes or until toothpick comes out clean. 11. Let cool, then sprinkle with powdered sugar. ENJOY!! What are some of YOUR favorite low-fat desserts? Comment below, or come tell us at HudsonAndEmily.com! Thanks so much for allowing me to post here today!! Ed. note: thanks so much for this amazing recipe! Sounds yummy! And only 200 calories a slice, you cant beat that. I will have to try it. Thanks so much again for having us! You are wonderful! !